Last night was Hope's first night at home! She was so excited that she stayed up most of the night to celebrate. 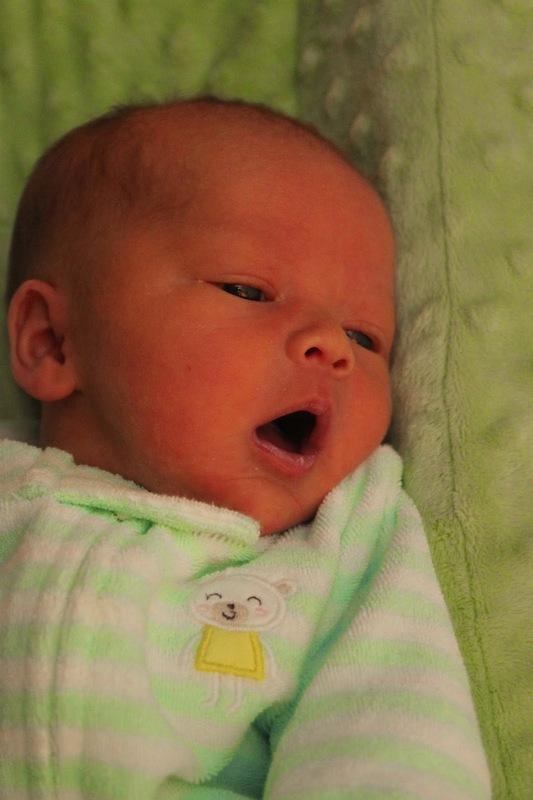 Actually, I woke her up every two hours (or less) to nurse - hoping that by today we would find out her Bilirubin levels had come down. It was an exhausting night... and today I am pretty confident that my clothes didn't match and my hair looked wonky... but I don't care. I'm feeling that grateful. I realized today that I forgot to mention something about Hope's delivery. The obstetrician told us afterward that she had had a true knot in her umbilical cord. I couldn't believe it. Perhaps it would have meant nothing if she had been born full term. But I can't help but think of what could have happened if she had continued to grow bigger - and that knot grew tighter. That information made me feel a lot more grateful for her early arrival. This morning, Ed took over with getting Brian ready for school. He must have swallowed his breakfast whole because it seemed he was walking into our bedroom within minutes! "I'm just going to hang out with you and Hope before school, Mama." After Ed brought Brian to school, the two of us (with our mismatched outfits and wonky hairdos) schlepped over to see our wonderful (and well dressed) pediatrician, Dr. Forman. He thought Hope looked great! We love our pediatricians... and we have a special bond with Dr. Forman, who was there for us on the day of Gavin's seizure in the emergency room. It was nice to see him for such a happy occasion. Breastfeeding is going well, but because I can't "measure" how much she's getting... I was worried going into today that she might have lost some weight. I was psyched when she was holding steady at 5lbs 9oz! After the appointment, we had to bring her over to the hospital for a heel stick to check her Bilirubin levels. Fortunately, we could go to the local hospital. Unfortunately, we also had to get back to the hospital where I delivered - which is much further. We forgot to bring home my pumped breast milk that the nurses stored for me! Ed took the trip for me and I stayed home with Brian and Hope. Brian is just so enamored with his sister - I love it. It reminds me of how happy and in love Gavin was with his little brother! Picture Brian's face at the end of the changing table asking a million questions about baby care. Or picture him showing Hope his favorite toys and explaining what Star Wars or Angry Bird characters were his favorites. While Ed was gone, Brian decided we should have a picnic on our bed - the three of us. So we did - we watched a Scooby Doo movie and ate popcorn until he said, "Okay - now let's just talk, Mommy." No surprise, he wanted to talk about Gavin. And he specifically asked me to tell him what it was like when he was a baby - and how much Gavin loved him when he came home from the hospital. That was an easy story for me to tell - those days seem like yesterday. Ed and I are so in love with our little girl. It still feels like a dream. We are so sure that Gavin had a hand in getting his sister here safely. 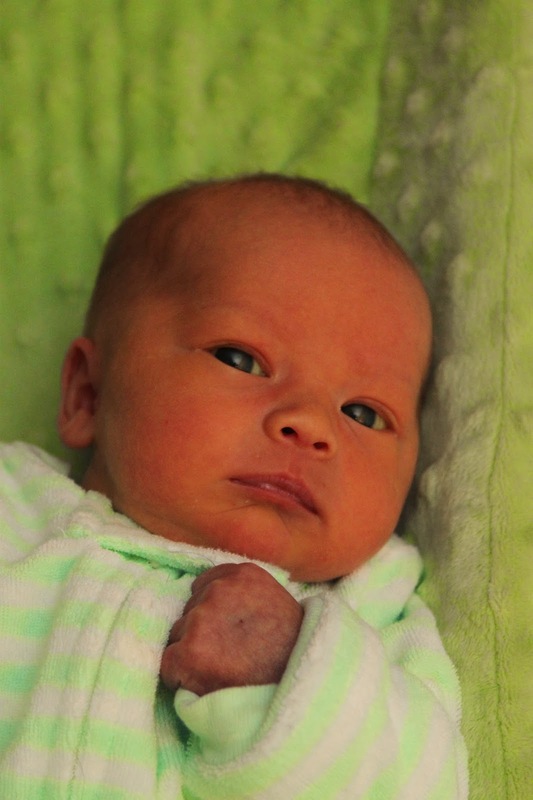 Later in the day, we got word that Hope's bilirubin levels increased. It's not so bad that it requires her to be re-hospitalized... but it's high enough that it requires phototherapy. 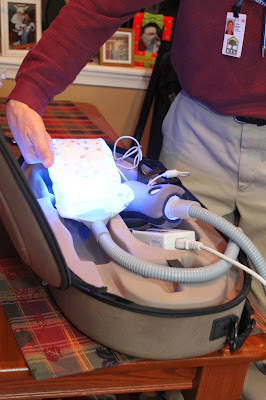 I had NO idea until now that they offer phototherapy at home! It's called a "Bili-blanket." A home care company delivered it to our house this evening and showed us how Hope should wear it. She'll keep it on all night long and then, tomorrow, a nurse will come by the house to do another heel stick and examine her. If the levels come back normal, she'll be able to lose the bili-blanket. She actually seems to like it! The machine that makes it run vibrates slightly and lets out a peaceful white noise. Maybe both of us will get a good night's sleep tonight! And I have a bonus night light if I have to get up to pee! Little Glo Worm!! She is adorable! Hope you get some sleep tonight! Oh Kate, she is so beautiful and how she has changed!! Seeing her now with her eyes open, I can see a little of Gavin in her. She sure is a pretty little girl :) I hope that you all get a good nights sleep tonight. My son had the biliblanket too! :) The heel sticks are the worst part. Otherwise, he seemed to like it too! Praying for her bilirubin and for you to get some sleep! I am so rejuvenated about reading your updates on your family! I LOVE it! I can't imagine what you're actually going through, but I feel like I'm right there with you! I am so excited for you and your whole family! What a wonderful new chapter in your book of life!! i think shes changing her looks , she has her own looks in the latest pic..an she s beautiful..
That's exactly what we had for my gal, who also needed phototherapy. We called her sci-fi baby while she wore it. Needed about 3 days for her levels to come down. Did you know you can rent baby scales? I had to rent one for the first few months so I could see how much my girl was drinking (she was not a good breastfeeder). You weigh the baby before she eats, then immediately after she is finished (don't change the diaper before the 2nd weigh in!) and the difference between the two is how much she drank. 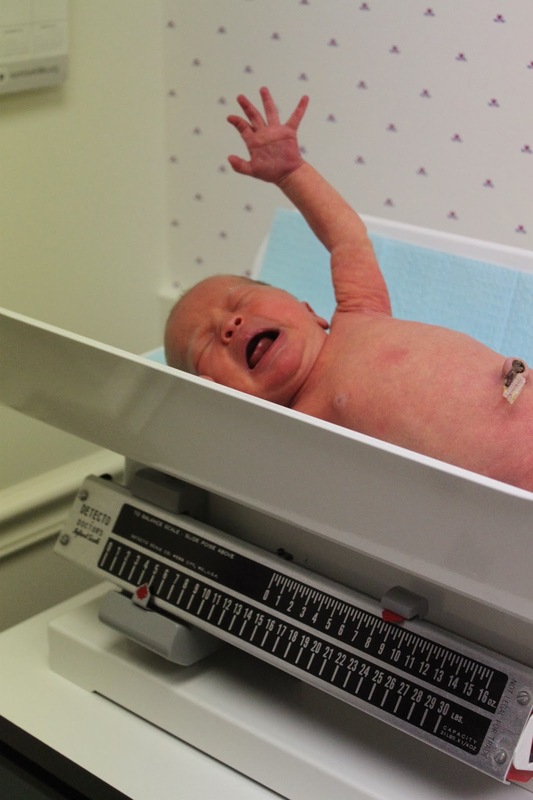 Ask your lactation consultant, she should know where to get a scale if you want one. She is just perfect! Wishing you a peaceful night. Just an fyi....if u have a sliding glass door where the sun comes in...u can place her on the floor in the sunny spot. ...it helps w the bilirubin. ..did it w my son n he didn't need the blanket. ..that way she gets the sunlight without being in the cold or exposed ro germs. She is gorgeous by the way....good luck n prayers sent ur way. Best nightlight in the world! Oh Kate - I am just SO happy for you! 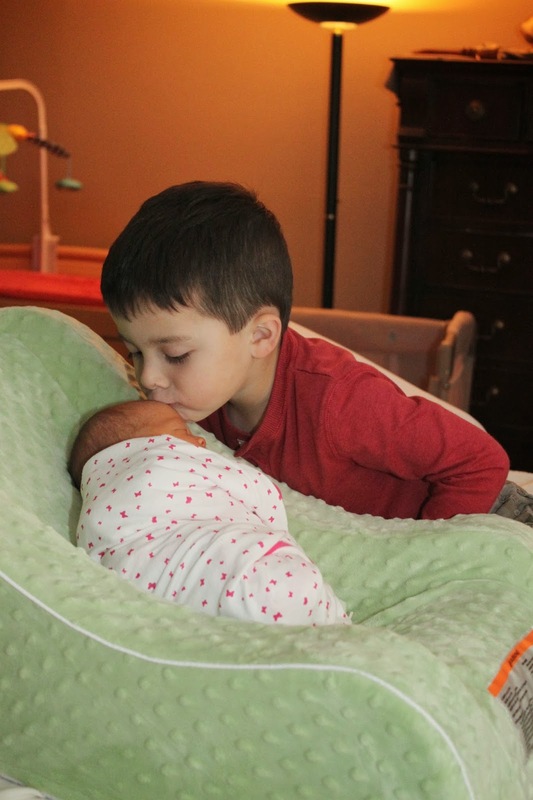 Hope is absolutely beautiful, and Brian looks every bit the adorable, doting older brother. I just know that Gavin is there with you - I can feel it looking at your photos. such a wonderful post. 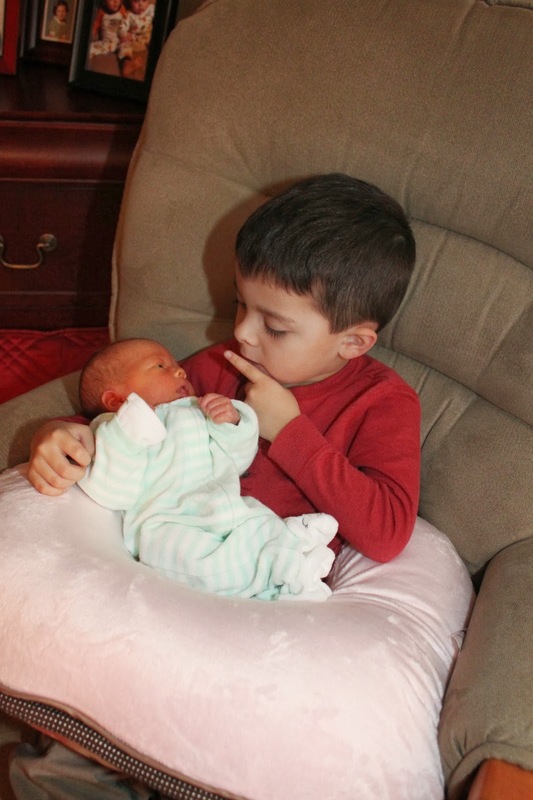 Gavin is definitely watching over his baby sister and Brian is following in his big brothers footsteps. what a great big brother Brian is. LOVE the pics! Kate I have tears in my eyes! She's so beauitful, she should bring your family joy and comfort! Our firstborn also had a true knot in her cord AND required a Bili-Blanket. 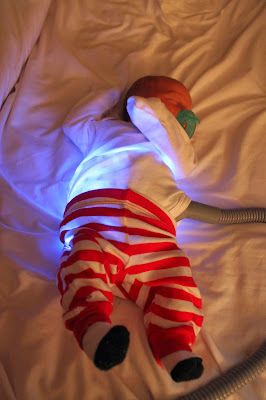 We carried around our little Glow Worm for 3 days and those bilirubin levels came down enough for us to ditch the blanket. She's now 10 1/2 years old, is reading at a 12th grade level, has a beautiful singing voice, and a heart to serve. Hope is blessed with a wonderful family and I'm honored that you are sharing her (and your family's) journey with us. Thank you. Thanks for sharing with us! Hope everyone sleeps well tonight! She is absolutely gorgeous!!! And Brian is a natural with her he is so sweet!!! God Bless you, Ed, ~Gavin~, Brian, Hope, and ~Darcy~.....your children are truly blessed to have such a wonderful family and beautiful guardian angels watching over all of you!!! Congratulations she is perfect!!! So so sweet!!! Brian is just the sweetest big brother!! I can't help but smile a big, loopy grin, at this post of Baby Hope (and how much her big brothers love her!). I love every bit of it. Enjoy.Enjoy.Enjoy. Hoe you get a good nights sleep!